WTOG CW44 television personality, Dr. Paul Bearer is available for event and private party appearances. Rates are variable due to distance of location and the date of the event. Rates begin to rise as Halloween approaches due to popularity of requesting Dr. Paul to make an appearance. Rates start at $350.00 for a three hour appearance dependent on the aforementioned factors. Booking Dr. Paul requires a 50% deposit and the remainder to be paid on site before the start of the appearance (you may pay the entire fee in advance if you wish). Dr. Paul will arrive at the event in character with the hearse (which contains a coffin). He and the hearse will be available for photo opportunities with guests. 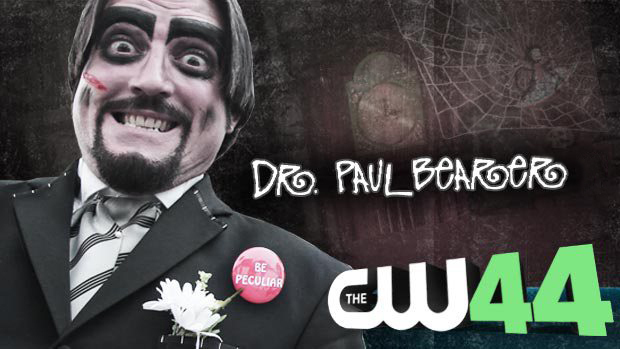 Dr. Paul can walk around the event and “be himself” by interacting with guests with his morbid, rated ‘G’ quick wit. He can also make announcements, speak on a panel, be a judge, or be a master of ceremonies. Included in this package is advertisement. Your event will be posted on DrPaulBearer.net and will also be posted his popular Facebook page, Instagram page, and Twitter page. For an additional $100.00 Dr. Paul will make a short video tailored to your specific event that he will run on his Facebook page and web site, you will also receive a copy of the video for your advertisement needs. The video will be filmed on the Tenement Castle set. Dr. Paul Bearer is a fun and whimsical addition to any event. Book early for the month of October as it tends to fill up early! Please contact michelle@drpaulbearer.net to book Tampa Bay’s favorite movie host!